San Bernardino – February 5, 2018San Bernardino International Airport (SBD) experienced triple-digit increases in cargo activity in 2018, boosted by the rapid growth of operations by FedEx and UPS, with new long-term leases at SBD. 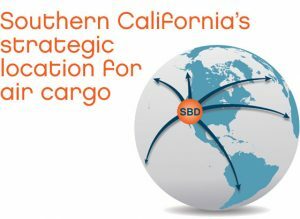 In addition to its strategic location in the heart of a vital goods movement corridor in Southern California, SBD boasts a new dedicated truck access road for air cargo ground movements to ensure greater efficiency for cargo companies at the Airport. ABOUT SBD International Airport: Located in the heart of a growing goods-movement corridor surrounded by the I-10, I-210 and I-215 freeways, SBD’s updated facilities include over 60 acres of concrete ramp, a new 5,000-square-foot cross-dock building with 1.6 acres of secured landside ramp, nearly 100 acres of developable land, and specialized cargo equipment. Visit [url=http://www.sbdairport.com]www.sbdairport.com[/url] to learn more.